Just getting back into trucking after about twenty-some-odd years away from it. Going through a school to get re-certified and licensed. Pretty excited about it. Wow, this was like a great book, couldn't put it down. When you see your doctor at the VA please ask him about this. My sister is on a bp pill, and developed very shakey hands. Her doc said she was having a reaction and put her on Lisinopril 10 mg (along with her bp pills). She takes it in the morning and no shakes. Keep up the good work. Hey there Nancy, Thanks for the compliment! I would have never thought that my life would be interesting to anyone else, but go figure huh? Ha ha. Actually, my doc has me on Propranalol for the tremor and it seems to be working quite well for the most part. He said that it is a really low dose so I may ask him about upping it just a little bit as I do still have a little bit of shaking sometimes, but it's not really bothersome at all. Would love to see pics of the truck. Hey Scott, I've got some pretty good ones so far, but haven't yet had someone else around to get me in some with the truck, ha ha. I just have to figure out how to get them from my phone to my computer. I hate Windows 10!! It doesn't do any of the things that were standard with Windows before. For now, I'll just have to say that it is really black and reeeeeaally shiny and I absolutely love it!!! Ha ha. I'll work on getting pics of it on here. Would love to use one as my avatar! Thanks Scott! I really appreciate it! Just a quick note as I am so very busy getting ready to hit the road again. Just got my permanent tractor yesterday and have been moving into it all day today. A lot going on...all my stuff was locked in driver storage until late this morning as by the time I got all of the signatures and check-offs and got back to storage with my new tractor, it was locked and the guy had gone home early for Thanksgiving!! Oh NO!!!!!! A lot of people did that yesterday, ha ha. Anyway, it is a 2015 KW T680 with just 102K on it. I swear that it looks and smells absolutely brand new!! I am so very stoked!! Can't wait to get back out there with it. Put a TV and microwave in it today. Will have to wait a bit for the mini fridge. Anyway, lots of dancin' bananas!!! Hey there OS. I'm a very rookie solo driver (about a month and a few days) and I have been really surprised at how accurate my trip plans are using my company's method. I am usually right where my plan says I should be and I know my DM loves that I am always on time and can be counted on. I even got one load a day late, but there was extra time before the delivery, so I was able to make up the difference and still made an on-time delivery. There have also been a couple of times that it was important that I get rolling right away and worry about the trip plan on my break after shutting down. Every one of these has resulted in one difficulty or another from me just trying to follow the verbal nav directions without having actually looked at my route beforehand. As a result, I take my planning very seriously and am getting to be someone my DM says she can rely on. And, we all know that that means good loads!! Don't forget time change this weekend! LOL I know what you mean. I spent most of yesterday thinking it was Wednesday! When what we are primarily concerned with is the date of the pick-up or delivery and the fact that most of these places are open 24/7, it's real easy to forget the name of the day!! Well hey there Chickie, No, I guess I hadn't seen this one, but I have now. I wish you the very best of luck in this, having had some trials and tribulations of my own in this first half of the first year back to doing it. I'm just trying to hang in there. You do the same!! Hey. I'm so glad to see you are doing well out here! You had a really rough start, but join the club! I know you were wondering about me. Hope you had a chance to see my update from a week or so ago. Still hoping to run in to you someday, but the chances are a little less now that I'm switching to dry van. But I'll definitely keep an eye out for ya! I'll update with my new truck number as soon as I can. Orientation got pushed back a little as my trainer is on hometime in MD. But I'm definitely enjoying my hometime. Catching up on some desperately needed rest. We were running overnights for the last two or three weeks at TA. If you still have my email, drop me a line and I'll send you my phone number. Hey there Chickie! Glad to hear good things! I think I saw the update, is it XPO you're going with? I'll have to look in my e-mail history, but I should still have the address. Good luck!! Just remember that doctor was not supposed to be looking out for your best interests. Rather, his job is to look out for the company and their insurance rates. He did his job well and now they have an employee proving him wrong. I bet he is loving it. Nope!!!! Still jacking with me. I was in the middle of a 1600 mile produce run when I got notified yesterday that he is shutting me down until Monday because he couldn't receive some of the telemetry from my CPAP machine and I am supposedly short on usage time. I use it every single time, even though it destroys my sleep patterns instead of helping. By the DOT regs., I shouldn't even be on it anyway, but...whatever!!!! (Stevens decided to use a much lower cut-off number than is required by the regs. is what I was told by the nurse.) Between the sleep study and the machine, that's over $1000.00 out of my pay and back into their pockets!! And... a very easy way for the doctor to keep right on screwing with me. Even my VA doctor asked me, "Wow, what's this guy got against you? He's a real piece of work!" Of course, if he won't let me work, then how they gonna get their money?!?!?!? Oh, and by the way, I read the article on here about the sleep apnia regs being re-written because of so many people being forced into CPAP therapy who were never intended to be involved or fall under scrutiny. Can't happen fast enough for my taste, though. I guess that I should know by now that every time I get really happy with what I am doing and how things are going, the sky is about to fall in on it all!! Man, I was covering lots of miles, early to my deliveries, and making really good money there for a while too!! I was really having fun doing it and doing what I was told to do. Are you mainly hitting distribution centers? How much city driving are you doing? Yes, mostly distribution centers and not much city driving at all.....so far, ha ha. Was just sitting here re-reading my last couple of posts to see if I forgot anything and realized that I should say something about the supporting staff that the drivers have here. I have already mentioned how great my D/M, Wendy, is but all of the rest more than deserve mention as well! The night dispatch guys go above and beyond to help out no matter what you need, large or small and are also very supportive. There have been a couple of times that I thought that I did something wrong or caused a problem. They were very calm and explained things and said that either I hadn't done anything wrong, or that it was something that happens a lot to new drivers and not to worry about it, just keep on doing what I'm doing as I'm doing great! The fuel department guys and all the rest are just the same way! They give exactly the right kind of support and help that keeps you wanting to do your best out here and feeling good about the job you are doing. I couldn't be happier with the way I am being treated as a dumb rookie employee here! Now, if we could just do something about that ignorant, arrogant cuss of a doctor, it would all be great, ha ha!! Awesome update. Now you are leaving all that past aggravation in the dust. Keep up the good work. Okay, I have some time to write, so I thought I'd do a quick update to the diary here. I'm sitting at the big "Alamo" Petro outside of Reno, NV finishing up a 34 to restart all of my clocks. Have been a little amazed at how quick you can run through 70 hours when your'e running hard. Of course you can still run on re-caps, but you never seem to get the full 11 hours back. It's always something like 8 1/2 or whatever. It still works though, more hours to run on. I have completed about three weeks as a solo driver now and am having a blast!!!! I have seven loads under my belt now and they have been a pretty even mix of longer and shorter runs. It is really nice on those days that you can get up in the morning and know that you can just run for eleven hours, take your required breaks, and rack up the miles. The days that you are at shippers and/or receivers, of course you don't get as far. However, I do have to say that so far I haven't really been unnecessarily detained anywhere like with my first trainer. I have a really great D/M, Wendy, and she is great at helping me out and gives lots of positive reinforcement and feedback. She gets my loads, tells me where I'm going, and I say, "Cool! I'm gone!" I feel like she really cares and does her best to get me really good loads. I did already get routed to NYC and I thought, "Wow, already?!? Oh well, might as well get it over with." However, I was almost there so early that they re-powered it to another driver in the area who was low on hours and could use the extra day to regain some. I was headed away from there with about 1500 miles racked up and never had to cross over into New York!! SCORE!!!!! I've gotten re-powered a couple of times now as I had extra time before the appointment by running hard right off the bat and getting most of the distance behind me right away. Works for me....rack up miles and not lose any time sitting at the dock! Anyway, my clocks will reset at about 6:30 this evening and I should be gone again!! Gotta take a nap this afternoon!! Still havin' a blast out here!!! Some of you are too nice. If anybody was treating me like that I would beat their A$$ back into last week. What is up with some of these Training horror stories. These Companies need to get a handle on things. I might understand if it was Jim Bob's Trucking with 3 trucks, but these are Big National Carriers! My thoughts exactly. I dread running into my first trainer on the yard as I am afraid I will go to jail! He needs a serious beat-down and I would love to give it to him. The company was great about getting me off his truck right away though, and onto a truck with a great trainer and I am now solo and loving it!!! I did the same as you. I tried to just gut it out and get done, until he started saying that he wasn't going to sign off on my training anyway. At that point, I knew I was just wasting valuable time being on his truck. Do NOT stay on that guy's truck!! 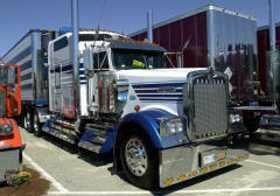 You are doing yourself an injustice if you do as there are trainers out there who care and will make the whole thing fun and informative so you will have confidence when you get your truck. I'm so happy everything worked out for you in the long run! And I've made that drive between Aurora and Lexington a few times. But I usually pick up beer in Aurora and run it to Grand Island, then pick up at one of the meat houses in the area: Grand Island, Madison or Schuyler. Well hey there Chickie!!! Been wondering about you! Yeah, I'm surprised that we don't do any beer loads. Load notice just came through!!! I'm gone again!!!!!!!! Hey Chickie...are you out there somewhere?!?!? My first load as a solo driver went exactly by the numbers...started off great. I was right up against the end of my 11 hour clock when my nav system decided to route me through a ritzy sub-division the last couple of miles (I think she musta had a stroke or something!!). Fired up my other nav system and got back on track. Got there and shut down for the night with 4 minutes left on my clock!!! Delivered the next morning and was in and out in less than 90 minutes!!!! Score a victory and on-time delivery for the noob rookie solo driver!! Was waiting at a truck stop for my next load assignment and called my D/M to talk things over and she told me what the load was and that I would dead-head from Aurora, CO to Lexington, NE. She said not to wait for the Qualcom message and to go ahead and take off for here. Was just about to call the fuel department as I was getting down to about an eighth on the gauge when my fuel recommendations came through. Made a slight detour to the first one and was fat and happy with full tanks again. I got here last night, got my trailer washed out and dropped and back to the truck stop to wait and shut down with 1 minute left on mt 14 hour clock!!!! So far, luck has been with me, but I'm really not comfortable cutting it that close on my clocks!!!! However, I guess it will show that I am out here to run, run, run, and get the job done safely and efficiently!! I already know what I will say if asked how I'm doing and how I like it. "I'm just out here having fun playing with my big truck amongst all of the other guys having fun playing with their big trucks!!!!" I really am, too. This is what I was working toward and why I got so frustrated at the set-backs. I already knew that I liked operating the equipment from 25 years ago, but now I don't have the family distractions and responsibilities and the equipment is soooo very much nicer!!! I am have an absolute blast!!!! Women always say that guys never grow up, they just get bigger and more expensive toys. I am here to wholeheartedly be proof of that statement, ha ha. Well, finally got cleared off of med-hold today (yeah, I know, for the second time), got my new medical card and should get my truck sometime tomorrow. Can't wait to see what I draw. I am really hoping that I can stay in a KW T-680.Still have some items on my clearance sheet, but they shouldn't take long to take care of and then I will be ready to be dispatched on my first solo load!! Woohoo! !